There hasn’t been any progress on the actual porch as we’re waiting for a lost shipment of materials to arrive. But, we do have progress! You’ll remember that we tore out the walkway, almost 5 years ago, that went to the street because we knew we would rather have something from the driveway. I then designed something curvy and Mike dug out the grass. After the grass was removed, Mike formed up the actual walkway. The walkway is 3 feet wide, and then fans out a little wider as it turns to the porch for a pad for the future precast stairs (which have been ordered and should be installed next week). We had planned for a Saturday morning pour, but with the threat of rain, Mike called it Friday afternoon and scheduled the truck for delivery at 5:00pm Friday evening. We actually went in with our neighbor because he wanted to widen his driveway for a basketball hoop. I hung around waiting to see if I would be needed, (and I love watching concrete work being done!) and snapped some photos of his project. Mike was schooled on how to drive the buggy like 5 minutes before he had to hop on and get to work. I snapped some pictures to show how great he was doing, and literally 5 minutes later this happened! The concrete was very wet and poured out of the buggy so fast! Luckily, our project was next and it didn’t require the buggy. Mike just poured right into the wheelbarrow and wheeled it over. And, it was around this time I had to go inside to get ready for dinner plans I had with some of my girlfriends. I might have felt a little bad, but this being a last minute pour so they were on their own! The truck driver actually helped Mike considerably, and when the guys were done across the street, they came over too to help finish. These were taken on Monday after the forms were pulled and sealer was applied. For those that aren’t aware of concrete delivery, there’s a small load charge for anything under a certain yardage, and a weekend charge can be added too. Since we switched to Friday we didn’t have to incur the weekend charge, but knowing our projects weren’t that big, Mike worried that we might get hit with a small load charge. So, what do you think he did? Found more concrete to pour! There were two sections of our sidewalk that got cracked when the dirt was delivered during the garage/backyard project. So, Mike tore that out and poured a new section. I’m so glad we’ve got a walkway now, but I’m itching for stairs, and our materials to get here so that we can have a normal looking house again! But that also means I’ll have to get out there and transplant all the plants back to that area and mulch, so maybe I don’t mind waiting for a little bit longer! While the ladies were brunching and celebrating my sister’s bridal shower this past weekend, Mike was busy working on the porch. 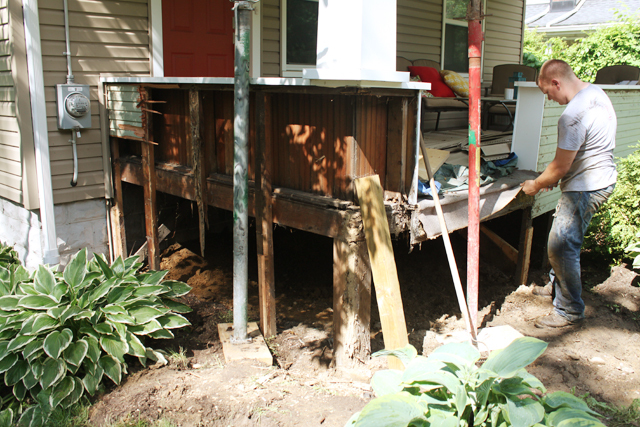 In the last update, Mike had begun stabilizing the porch. Over the weekend he finished stabilizing it, and began the framework for putting it back together! You’ll also notice he killed all my hostas and boxwoods. Just kidding, but that’s kind of what I thought when I came back from the bridal shower! He moved them all to the side yard (something he tried to make me do, and I continually told him it would be fine to just work around – whoops!). 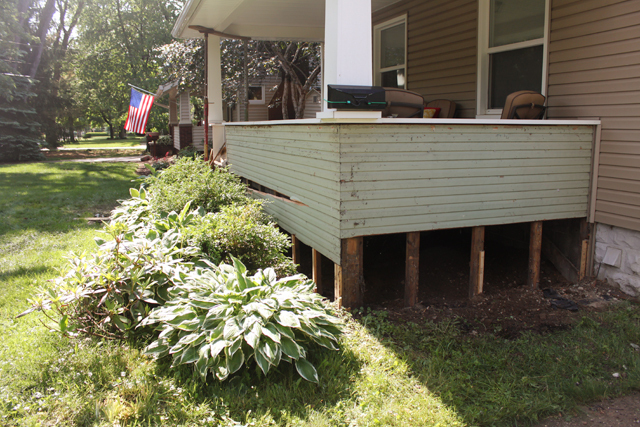 He not only replaced the boards that had termite damage, he reinforced areas that weren’t properly supported, as well as beefed up the supports under the columns. He also added some girders underneath for even more support. 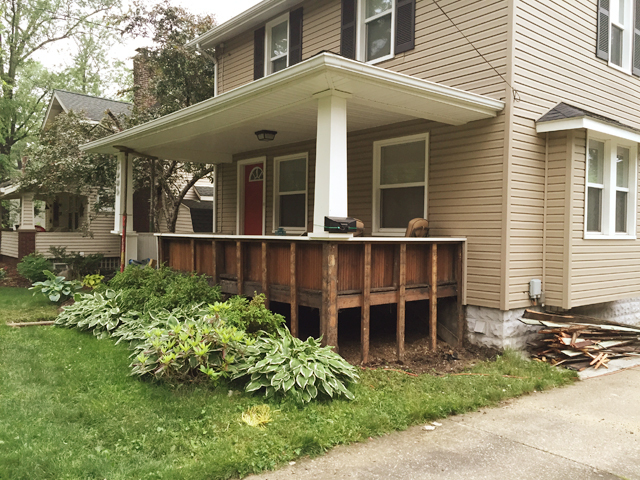 This porch is going to outlast the house! He then added OSB as the base for the siding that we’re re-attaching. Monday, he had river stone delivered (the same stuff we’ve used on the side and behind the garage) and used it around the posts to act as a barrier between the dirt and building materials. All the new wood added was all pressure-treated as well. Mike also outlined the new walkway and plant bed and removed the topsoil and started grading. We’ll reuse the topsoil in the bed as well as fill in some low spots in the yard. One of them being right where Mike threw all the topsoil. This was very exciting because we are now able to see the path of the walkway and envision things in relation to it. It’s been mostly abstract up until now, with phrases like “I want it to be winding” being thrown out when talking about ideas. This week we plan to get some materials and layout the walkway for pouring concrete. We’ve also ordered some of the material for the porch and hope to have that wrapped up in the next couple of weeks! Our Annual Crawfish Boil is June 27th, so that’s our unofficial goal for getting as much of this project done, we’ll see! My younger sister is getting married this August, and as her Matron of Honor I threw her bridal shower over the weekend! I used the geometric shapes as my décor inspiration, knowing that the restaurant already had some louder colors on the walls. Obviously, the big décor feature were the LOVE balloons, which I ordered online here, and had filled at my local Party City. They were the focal point and background for the gift table. For the tables I created some basic himmeli style shapes using some coffee stirrers and wire. They were super simple, cheap, and my mom and I made them together on Saturday, all around win! I created a menu with selected items from the restaurant’s menu for the guests to chose from, using the pink hexagons to carry the theme. For favors I made little Mimosa soap bars! On the back they read: “From my shower to yours, thank you! From the future Mrs. Michelle (her soon-to-be married name)”. So cheesy, but oh so cute! For a “guest book” I created a Date Night Jar, and guests were asked to think of a date night idea for the bride and groom. Also, on the table were cupcakes made by my sister’s friend, and embellished with gum paste decorations I made using a Cricut Cake. Its was such a pain, and gum paste tastes like sugary cardboard, but they turned out exactly as I envisioned and looked awesome with everything! The food was ordered and served very efficiently by the servers, so much so that we were flying though everything much sooner than I thought! We started with a simple game called “Who has the groom?”. I made cards with actors heads on tuxedo jackets and one with Michelle’s fiancé Keith’s head. Before everyone got there, I placed an envelope at each place setting, underneath the kraft paper. Whoever had Keith won! For the main game, we played “How well do you know the Bride?” while we waited for our food to arrive. This was a simple game of 15 questions, but it was pretty funny since some of the guests turned out to know Michelle even better than she knew herself! After we ate, Michelle opened presents and I set random timers throughout and whoevers gift she was opening when the time went off, got a gift. Since I forgot to grab a photo of my sister and I on my camera (doh! ), here’s a photo of Michelle, and my future sister-in-law, Kelly who is getting married to my brother in October! It was really great to throw a bridal shower for my sister, and to celebrate her upcoming marriage to Keith. Now the countdown is on for the big event, the wedding in August! Before we did any demo on the porch, we came up with a quick plan of attack as to what we wanted the walkway to look like. In the end though, I came back to my original idea basically because our house is a large box, the porch is a box, and there are many lines and edges, having curved lines would offset that. My mom helped me come up with this idea years ago while we planted what we had thought might have been temporary plants along the porch. The boxwoods may need a little cleaning up, but I really like how everything is filled in. We planted the hostas in a staggered formation so there’s now an organic curved line which we will follow when we pour the walkway. I drew a very rough (not to scale) drawings showing how everything is laid out and the garden areas we plan to fill/add this summer. And, when I say not to scale most everything was fudged, but the deck really is the same footprint as the house – it’s massive! The rhododendron hasn’t done that great, and I may get 2 clusters of flowers a year if I’m lucky. So, I’m thinking of moving him to the left side of the house, maybe sticking him at the corner of the house where the deck starts. If he doesn’t make it, it’s okay I’m not too emotionally attached to him. We have to fill in the right side of the porch and while I begged for the boxwoods and hostas to stay, the giant grass was moved for ease of access so I have to find something with height again. Back to the left side, the red plant is my pride and joy, a $12.50 clearance potted Japanese maple. It was a splurge purchase at the grocery store 3 years ago, the Mike planted in the most awkward spot by our deck that has blown up this past year. We’ll move that and fill in that grassy area with some nice flowering plants. On the other side we got 4 arborvitae from our friends during there front façade remodel, but we lost 2 of them. Here’s what it looks like from the other angle, and what all 4 of them looked like last year. We plan to get 2 more to replace the ones that died and create actual beds and fill in with some smaller plants with something to anchor the end where the deck stairs end. 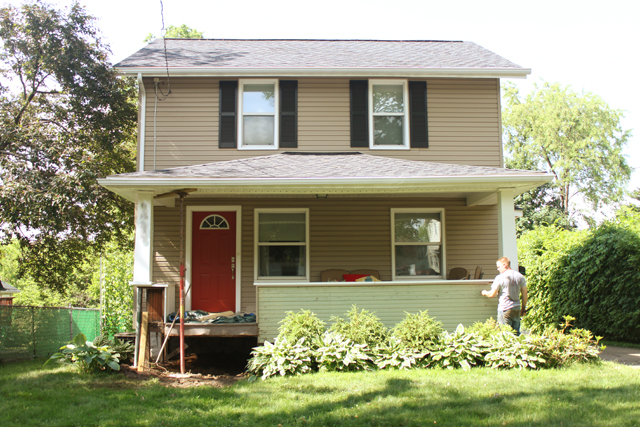 This post is getting way too long, so I’ll end here with an update on the porch. Mike has finished stabilizing the left side, (the worst side by far), and has moved all the temporary posts to the right side and will fill in any more support needed over there. Once he’s done with the main supports, (under the pillars), we plan to add stone for all the secondary supports (the 2x4’s) to sit on, as well as provide a barrier so we don’t have siding sitting directly on the ground again. We’ve also discussed a faux stone façade on the lower half as well as beefing up the pillar bases, but that adds a large chunk of change to this project. We’ll see what we finalize in the coming weeks. I mentioned we’re focusing on the outdoors this summer now that the insides are all remodeled. 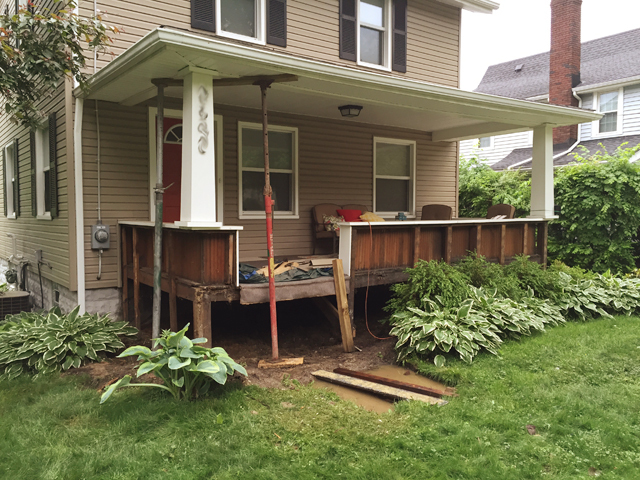 After 5 years, we’re finally going to get a front walkway to the porch! This picture is pretty deceiving because those stairs go down to a concrete slab then straight to the grass, it’s so cute to watch all the confused kids at Halloween whose parents told them to only walk on the sidewalks! 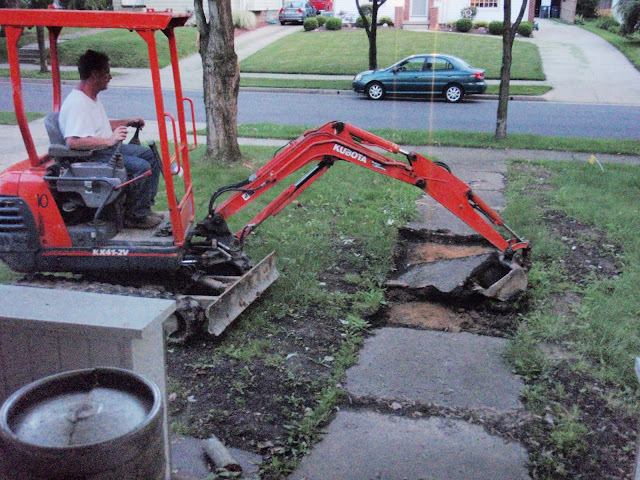 Back when we were building the garage, we had our friend tear up the walkway that went out to the sidewalk, which never made sense to us. We knew we would someday add one that went to the driveway. Well almost 5 years later, we’re finally getting around to it! There’s a couple problems though, which is the reason we’ve been putting off this project. First, we knew we would be replacing the stairs. I didn’t get a recent photo before Mike tore them off, but the carpet was moldy and gross, not to mention very unstable. 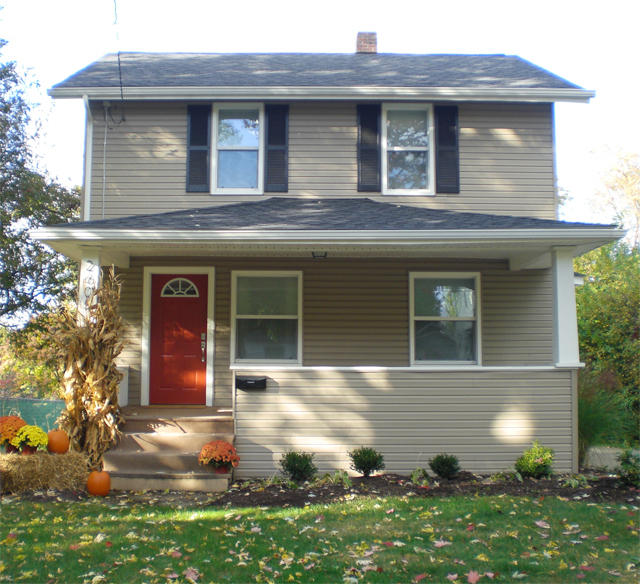 Also, the siding went all the way into the dirt. This is a major no-no. So, we knew we would have to address this as well. We were dreading what was underneath knowing from experience, this house has many shoddy shortcuts hidden underneath the visible. Our fears were confirmed when we found termite damage, poorly supported beams, and worst of all, a giant 2’ drop in elevation that slopped towards the house. 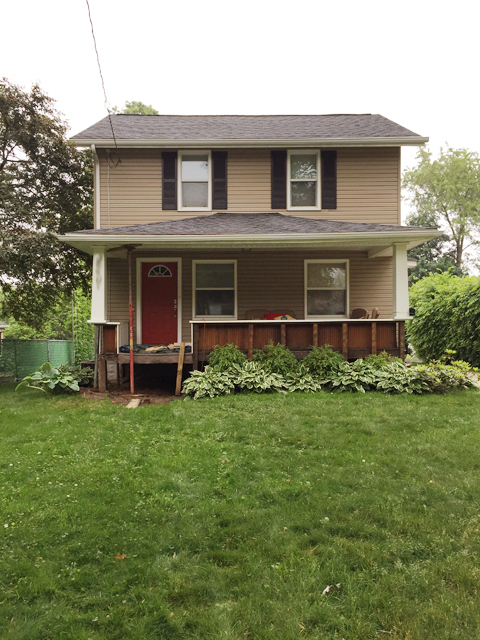 We started demo over the weekend and started by removing the siding, then Mike removed the old siding underneath, (the light green stuff). We were able to procure some clay material so we shoveled some underneath to fill in the large hole. I stayed on the outside, while Mike fought spiders and the confined space to even it all out. We got 3 truck loads in there over the weekend, but Mike thinks he’d like 1 more to be safe. 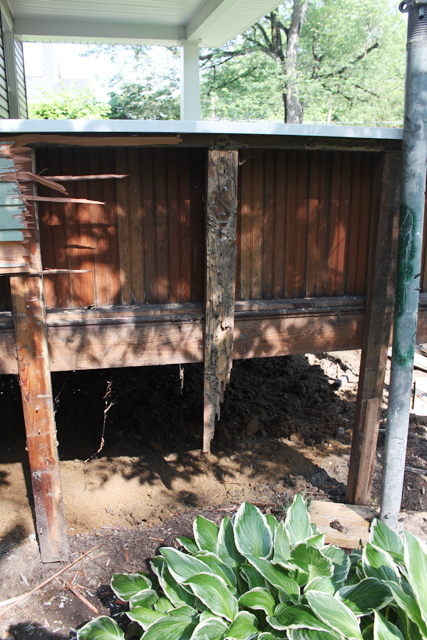 While the right side supports were half-way decent, the left side showed significant termite damage. Ugh! Luckily, it was old damage, and live termites weren’t visible (we have had other areas of the house/garage treated in the past). Mike removed the post holding up the pillar and used some temporary posts to hold the roof up. The damage went back the entire right side to the house. Not only were some boards completely covered in termite damage, all of them were barely touching the ground, we were able to move them back and forth a couple inches without any resistance. 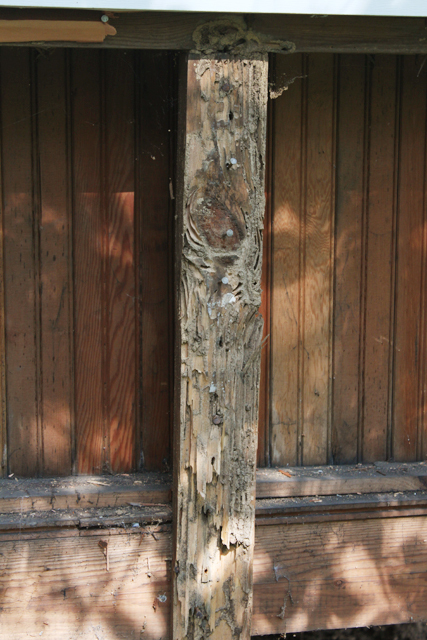 Meaning the main post sitting under the pillar was the only thing supporting this side of the porch. You know, the one that was completely ruined by termites. Mike has always described walking on the porch as “spongy” feeling. Now we know why! This center 2x4 saw the most damage. In the middle of demo we even contemplated tearing the whole thing down and starting from scratch. In the end, we decided to remove the outside envelope and replace/add more supports as needed. We got hit by rain on both Saturday and Sunday, but between downpours we were able to get all the demo done. I feel slightly bad for our neighbors for this view, but they all know that something much better is on the other side of this project. This week Mike’s going to price out and get the materials for rebuilding everything and we’re also going to finalize our plans for the new look. I’ll share our plans for the front later this week, as well as the rest of the yard!